On 24 January 2015, Mid Term Review (MTR) Team has observed MPDR intervention as a part of Maternal and Newborn Health Initiative of Joint GoB-UN in Thakurgaon and Panchagarh districts. The MTR team joined in a verbal autopsy of neonatal death case occurred in Debiganj Union of Panchagarh District. From the review they identified that medical and social errors were the key factors for the death of newborn. Consultants from DFATD Dr. Josef Decosas and Dr. Azam Ali expressed their heartiest condolence for the deceased family. The team also expressed their view on facility delivery. The autopsy was conducted by the Health Inspector of the union.The Civil Surgeon of Panchagarh, the UH&FPO of Debiganj, Panchagarh also participated in the session. 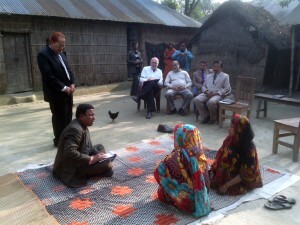 During the visit, the team also observed death mapping of Thakurgaon and Panchagarh districts and was informed about the maternal and newborn death status of the districts.